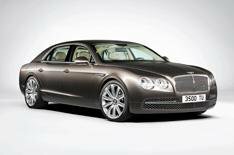 Bentley Flying Spur pictures leaked | What Car? Official pictures of the new Bentley Flying Spur have been leaked ahead of the car's launch at the Geneva motor show next month. The Flying Spur looks to have a cleaner design with most of the changes at the rear. The new car features LED lights and more aggressive styling than the previous-generation car. Its interior appears to be as luxurious as you would expect of Bentley, with leather and wood covering the cabin. Expect the Flying Spur to be powered by a 6.0-litre W12 engine. Price details and delivery dates should be announced at the Geneva show.